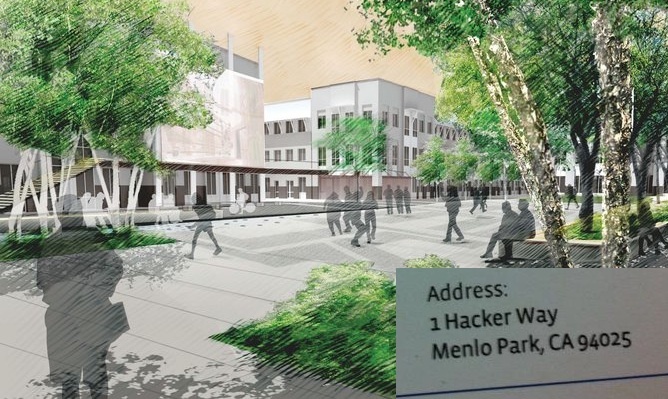 Apple has 1 Infinite Loop, Genentech has 1 DNA Way, and now Facebook has its own vanity headquarters address: 1 Hacker Way, Menlo Park, 94025. Seen here on a brand new business card of a Facebook employee, the address epitomizes the company’s internal motto “Move Fast and Break Things”. 1 Hacker Way should help Facebook project the image that it is an engineering company where coders can experiment and find autonomy rather than bureaucracy. Facebook is slowly transitioning from its existing buildings in Palo Alto to the new Menlo Park headquarters which you can see photos of here. Back in February, Facebook formally announced its plans to move into the former Sun Microsystems campus at 1 Network Drive, which can house up to 3600 employees. The relatively remote location was derided with the name “Sun Quentin” because employees are effectively imprisoned there due to the lack of nearby restaurants and businesses. Hopefully the playful address will make it seem more fun to commute to. 1 Hacker Way is the central address for the campus, though specific buildings have their own addresses. For example, 18 Hacker Way is the legal department. An employee tells us that the campus was originally slated to be addressed 1 Social Circle, but Google+ and its Circles friend lists led that named to be scrapped. We’ve compiled a list of some technology companies with vanity addresses, but hit us up in the comments with any we missed. Thankfully Facebook chose a less boring and narcissistic one than Dell, though the American Physical Society gets my vote as it even made the street name (or odonym) something nerdy.